Three years ago, I was at the hospital laboring away. I didn't know that by the afternoon I would have a little baby girl. I had a fairly easy labor, but didn't know that was almost the last thing that she would make easy for me. A tiny little thing compared to the over-nine pound giant her brother was, she was still over eight pounds and feisty from the moment she emerged. The Middle Girl has always been a bundle of energy. She's quick tempered and sneaky, but she's also quick to flash a smile and positively radiant. Although I sometimes think that if she'd been born first, no other children would have followed, she's also the child that made my brother-in-law want to have children some day. She's spunky and fun, even if we do hear at least one scream of rage from her every morning and hear her say things like, "I had to hit my brother because he smiled at me and I didn't like it." Although my son is the cuddler and she has never been, I really understand The Middle Girl. I'm the middle girl too and not only that but we share the same looks, the same tastes and I hear that I was both as chatty and as high maintenance as she is when I was small. She's as close as I'm going to get to a clone. Although I'm not exactly sure I ever wanted a clone -- especially one that mimics my bad points at least as well as my good ones -- I can already tell that having a daughter is different from having a son. She likes to go with me places, she likes to pretend girly things and she loves it when I paint her toenails. And for some reason, getting to do those things is a real joy for me -- more, I must admit -- than playing army men or Legos (although I enjoy watching my son do those). I never know what a year will bring, but three was a really wonderful year of growth and change for my son. He went from baby to kid when he was three. I look forward to seeing The Middle Girl making that change, despite all the challenges and struggles (and with her I mean a lot of challenges and struggles). She's still my tiny girl, only this morning outgrowing her size 18 month jeans and moving up to a size 2T, but she's twice that size in personality and vitality. I can't believe it has been three years already. I think she's about 27 lbs. Maybe. So probably about the same size as your one year old. She can fit into her sister's 12 month size shorts, since they are cut for a diaper and she wears underwear. Tell her Mr. Terry says he thinks she's as cute as a flower bug. Mr. Terry, what's with the garden pest? Tell her that Miss mcgdog thinks she is like a perfect rose bud just beginning to open. Really, no one calls me Miss mcgdog. It's my security system preventing me from sending my real name. Try Miss M.a.r.t.h.a. Happy Birthday, to both of you. How sweet! Hope she has a thrilling birthday! Such a cutie! All of my kids exist on the small side of the curve too. Where's the cake? and is Terry bringing the ice cream? Happy Birthday to the cutie-pie. Happy Birthday!!! What a smile! The cake is coming on Saturday, so we made cookies for yesterday's celebration. Being a second child and learning all the ropes, she's insisted on having a party. Or more specifically "A Butterfly Birthday Party." I'll be making a butterfly cake and I made butterfly wings for The Middle Girl, her brother and the two little boys who are coming to her party. My husband and I are so cute (cue vomit now). We don't just celebrate our wedding anniversary. We also celebrate our first date. Really. I don't know why we still do, but we do and it is a good excuse to go out on a date, so why not? The funny thing is that now, eleven years later, we can't remember what actually happened on that date. In fact, we can't remember whether we're celebrating our first date -- to a college football game -- or the night we held hands while watching Henry V and grossed out all my friends -- or the night we walked out to Green's View and we smooched for the first time. Despite not knowing exactly what we're celebrating, we celebrate anyway. On Friday night, we went to Cafe Margot -- or Margot Cafe -- and ate, talked and enjoyed a chance to talk without stopping arguments, discussing Legos or feeding Cheerios to the little one. The restaurant is a very good one and definitely one I'd like to go to again. The meals are very good -- I had salmon and Justin had pork tenderloin and the desserts are delicious and all made in house. That's my kind of restaurant. Happy eleven years since we started dating, or something, my love. Here's to many more. 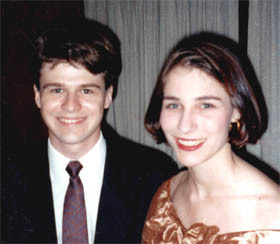 And if you want to see what we used to look like -- a few months after we started dating -- look in the extended entry. Time sure does fly doesn't it? Jordana, you look absolutely beautiful!! But then, I haven't seen a photo of you yet where you didn't. I don't show off the really bad pictures, GOYL. Maybe some day I'll have horrible photo day though. So cute! So young! So in love! It shows!! We don't celebrate our first date, which is probably about right since we forget our friends' and families' anniversaries and even our poor nephew's birthday more often than not! A romantic meal sans children...now that's something to celebrate :) Congrats! Justin does look young in that photo. No wonder I don't trust him yet. If my wife saw this entry I would be in big trouble. Happy Anniversary! Looks like you were headed to a formal in that great picture. For the last several days, I've been opening the "new entry" page to type something, but then after staring at the computer screen for a few minutes trying to sift through all the thoughts floating around in my head, I have been giving up and closing the window. I think I'm just tired and busy. In the last three days, I've been everywhere but home. I've taken The Middle Girl to the pediatrician, gotten the annual emissions test on the car, gone to Home Depot for soaker hoses for the one flower bed we haven't laid them it, taken the girls to story time, gone to Target to shop for a baby shower present, gone to the fabric store to look for something to cover our living room chairs, gone to the park, gone to a toy store to look for a present for The Middle Girl's upcoming birthday, renewed our license plates, and shuttled The Boy to and from school. I've also cleaned floors and a bathroom and done mountains of laundry. And then I've been staying up late painting, which I will blog more about at some later date. I have much of interest to me going on and yet I can't seem to focus. I'm looking forward to the weekend and a little break. I'm also looking forward to tonight, when Justin and I get to go on an actual date without kids thanks to a generous babysitting offer from some church friends. And headaches? Besides the children bickering over plastic animals and whether or not the light should be on, I've discovered that I am definitely a bit of a caffeine addict. I forgot my morning tea in the rush to get The Boy to school and I am feeling the effects of that decision. Excuse me while I pop some ibuprofen and drink something with lots of caffeine. Hope your headache goes away and you have a fabulous date night! I have had days where the empty screen mocks me. I also definitely feel the busy, frantic feeling. I know I get used to the carefree days of summer which makes it hard to get back into the grind. At least you are staying up to paint. With my oldest son doing driver's ed, I have to wake him up at 5 am so I am falling asleep WAY early. Be glad when that is over! I am so with you sister. I've also discovered that since I have caffinated coffee in the morning, about 3 cups, I need a little shot of caffiene in the afternoon to stop the headache. I guess I better go back to the half caffinated stuff. Had to take Mayhem #2 to have her hand re-x-rayed, and still no break. If it's not better by later this week, we have to see a hand specialist. Pray it gets well. I hope your date night was lovely! Mercy, my husband once bruised the side of his hand. It was x-rayed and there was no break, but the doctor said that a bad bruise to the bone can take a long, long time to heal and his did take more than a month to stop hurting. I hope Mayhem #2's hand gets better much sooner and that no serious damage was done. At the beginning of the school year at my son's school, the teachers visit their students at home. It's probably to make sure we are all in compliance with the no TV, no plastic toys and all organic food rules. Rats, I forgot to hide the Cheetos and put out some tie-dye! Actually, I think the purpose of the visit is so that the teacher and family can get to know each other better. We had The Boy's home visit on Saturday. All was well, and the teacher ignored the TV, plastic toys and Cheetos. We had a nice chat and heard about how things are going from the teacher's perspective. She asked us what we hoped for in The Boy's schooling -- what we were looking for. I hadn't thought much about it, but off the cuff I babbled something about wanting him to love learning, stay creative and be happy. And the teacher told me that "studies show parents can't make their children be happy." I almost said, "Duh!" but didn't think that would set the right tone. But really, they needed to do a study to figure that out? Show of hands, did you think you could actually make your child happy? Sure the bribes will shut them up and sometimes win you a hug, but we all know that's not happiness. Granted the teacher doesn't know us well and maybe there are some parents out there who think there is a mystical formula that will create happiness, but when I said happiness I really meant contentment. I want to instill in my children the ability to find contentment and peace no matter what good or ill might befall them. Which is why we take them to church, teach them about God and also why we hope they will remain creative and interested in learning. To be happy and content, I think one must first have faith and second be able to amuse oneself. I can't make anybody happy and I knew that without hearing about studies done on the subject. I do hope that we can give our children the foundations on which to make their own happiness, but the rest is really up to them -- not that they'll object to a few extra cuddles and trips to the ice cream parlor along the way. "To be happy and content, I think one must first have faith and second be able to amuse oneself." I love that. That is profound. Did the teacher have any other studies to quote, like some proving that objects fall if you drop them, or that placing your hand directly in a fire is uncomfortable? I generally don't hand out my blog URL (or even admit that I have one) to people I know. I blurt it out once in a while, but generally it's just my little secret. I'm not sure how the people at The Boy's school would feel about my calling the place hippie German school anyway. Several people asked if there was a room behind the new window. Currently, that is our attic. It has subflooring, but is not insulated or drywalled. We talk about turning it into a room eventually, but even assuming we build storage closets/shelves/drawers in all the knee walls, we would certainly have to give up a lot of storage space, and that small attic space is almost the only storage this old garage-less and basement-less house has. So it's conversion to liveable space is somewhat in question. Does the attic have a proper stairwell, or do you have the pull-down ladder access? Neither! We have a one-and-a-half story house. It was originally a single story, but when it was renovated the roof was raised in some sections and part of the second floor was left as attic space. It has an almost regular doorway off the area surrounding the stairs to the second floor. "Almost regular" because the door is about 2 feet off the ground and will not be easily given it's own short staircase because the intake for the second floor heating/cooling system is in the way. There are a few other issues with converting it to a room and we haven't begun to investigate the codes or to figure out how one would go about doing all that would need to be done to make it a real room. Maybe in a few years we can begin to think about it. If we feel like we need living space more than storage space. Trub has the Carnival of the Recipes up, with some especially good sounding recipes. We still have a lot of raspberries coming off our raspberry brambles so I think I will definitely be making the Apple Raspberry Crisp. I also thought the Frugal Emergency Supplies recipes were both useful and tasty sounding. But why rehash the whole Carnival? Go see which recipes sound best to you. As I've mentioned on and off, we've wanted to put a window in our front gable since we moved in over three years ago. As long as we've been here, the gable has looked bare and a photo from when this place was broken down and decrepit shows that it used have a fancy attic vent and gingerbread. While putting that back could have looked nifty, we really wanted a window so that the attic could have the potential to become a real room some day. This summer we finally had the funds saved up for such a project. After learning that the lancet window I really wanted would cost about $4000, I put aside such foolish notions and figured out what might be within the realm of possibility. We finally settled on three rectangular windows (two small ones flanking a larger center window), which can be seen all over our neighborhood on houses similar to ours. The side windows are fixed and the center is a double-hung. I really wanted the gothic arches and diamond design for the muntins on the upper part of the center window, but even that would have added to the cost quite a bit. We got another cheaper, but equally authentic if not so Gothic pattern. All this we decided way back in June. We also met with the contractor and decided on fiber cement shingles and made a few other design choices. It all seemed to be on track. The window came in towards the end of July and the store started bugging us to get it out of their warehouse. In mid-August our contractor was all set to do the installation when we hit a snag. I am apparently incapable of getting good information out of the lumber yard and what I thought I had learned about fiber cement shingles was not accurate. Their cost was way too high and they would take over another month to get. So we had to rethink what we wanted and decide whether we wanted a different shape of fiber cement shingle that was easier to find and cheaper or did we want to get cedar after all. We went with cedar. We really wanted something other than half-rounds and with cedar we had far more choices for patterns and designs. We bought a box of arrow shingles and a box of square shingles from Vintage Woodworks, which arrived in just three days. They were a really great company to work with. Once we got the shingles, we had to paint all 192 of them. We spent three days priming every side of every shingle and then painting everything except the back. We also primed and painted all the trim for the window and additional trimwork. We weren't paying our contractor for his painting expertise, so we did all that work ourselves. This Monday morning the contractor and his assistant rolled in. We'll have some puttying and touch-up painting to do, but the worst is over. It rained today and I checked for leaks. Everything is dry. I keep going outside to look at my pretty house. It looks a lot better already and just wait until we get the rest of the vinyl taken off and replaced with something else some day. But that is a project for some other year. Very nice! The Gothic window doesn't seem like it would have fit the character of the house as well, anyway, and these windows let in lots more light! The Gothic muntins are on most of the windows in the neighborhood and although there is only one house around here with a lancet window, I figured that if it was good enough for American Gothic, it would look okay on my house too. But the price of this window was far more reasonable and I'm really happy with the results. And by the way, don't get sick!! It's amazing how much more interest the front facade has with the window and shingles. Wonderful work! Good luck with the cold. We all had one and it seems that every friend and blogger I know has been sick. Your house DEFINITELY has curb appeal. And it's so nice to hear folks say loving things about their homes...staying there...etc...With folks constantly on the move, your improvements sound very satisfying. Too many families make changes in their homes just to sell. Btw, love your porch. I'd be sitting out there right now, if I were you! Oh, and your picket fence is super. I want one!!! Melissa, our curb appeal is all for us. We really don't want to move. We like our neighbors and our location, and we like our house a lot too. The porch is nice, though the mosquitoes aren't. I don't use it as much as I should though because the baby is such a wiggler and would head straight for the steps. Speaking of American Gothic, I really think you owe it to your loyal readers to get dressed up, find Justin a pitchfork, and get someone to take your picture in front of your new creation. Oooh- that gives me an idea! Jay in the pack'n'play on the front porch while mama sips lemonade. Ahhh. That looks so incredible. Don't you love projects that make such a big difference! Is there are room up in your attic? It looks fabulous, Jordana! It really changes the whole front of your home...just wait until there is a room there someday! Wow, I love it! Hope you are feeling better! My head is stuffed with cotton, or feels like it anyway. I fear a sinus infection may be in the works, but I am still hoping it might just go away. Things move on at a rapid pace, whether or not I feel up to dealing with them though. The Middle Girl will be three in less than two weeks and since she has an older brother to learn things from has decided she needs a birthday party. I'm not terribly inclined to throw such a thing, but I suppose birthdays do call for a little spoiling, so we'll be having a butterfly party (per her request) for her and the two boys her age from church, plus I'm going to invite the three teenage sisters from church with whom my daughter is totally in love and an attorney from my husband's firm who told us he expected to be invited to all of our children's birthday parties. I painted this to put on the invitations. I'm not really trying for the übermom award. It only took 20 minutes or so. I spent more time laying out the invitation in Word and longing for Pagemaker. I am not sure what one does at a butterfly birthday party. Since there are only two kiddie guests, I might make them all butterfly wings, but otherwise I think we'll just stuff them full of cake and let them run around. They are a bit young for most crafts and games, and the most fun parties seem to involve plenty of time when parents aren't scripting things. Which leaves me to decide -- do I make a cake in the shape of a butterfly or use my cake pan that has flowers in the pattern and stick plastic butterflies on it for decoration? I'm leaning towards the latter. That would give me a cake and toys to play with all in one. Well, considering we're gathering my side of the family at a rented vacation home in Massanutten next week for Jay's first birthday, you can expect no criticism from me! I told them that showing up was a better gift than anything else they could bring (and goodness knows Jay won't be expecting wrapped gifts, though by now I'm sure he could extract them), but you know how families are with their youngun's. Paul's family wasn't able to make it, unfortunately. We'll probably go visit at Thanksgiving. I think if you just have more butterfly things around than usual, she'll feel like she had a butterfly party. Maybe you could pin a butterfly or two on her clothes to make her feel all butterfly-ish, or stick some here and there around the house. They have some little silk ones in the floral section of Michaels for not much. I'm with you about activities for kid parties-don't need much, if any. Go for the flower cake pan. The added butterflies would be great fun for the girls to play with afterwards. Oh and I'm a huge fan of unscripted parties. The kids loved it when we ran the sprinklers for them. Wrap her in a chrysalis, tell her she's still a caterpillar and can't come out until she's a butterfly. Once everyone is at the party, then she makes her grand entrance, everyone applauds for the beautiful butterfly fluttering her wings. Afterwards she can run around the house with the other two yunguns while the adults eat cake and talk about stuff (and her big brother can run after them with a butterfly net). You are a cool mom. My 5 year-old's last party was butterflies and it was waaaaaayyyyyy overdone. But it was our first REAL party with friends and all. What can I say? We were stupid. Your ideas are all great. The floweredy cake sounds fabulous. Go with it!! We got our recovered sofa back last week. It looks a lot like the photoshopped version only much better. Of course, the nice new sofa makes the channel-back arm chairs look shabby and the gold upholstery on them is an entirely different gold from the sofa. So if we can ever decide what might look good on them fabric-wise, I think we'll be sending them in for recovering and spring tying too. While all this may sound some what extravagent, the sofa was originally bought for about $25 at a rummage sale and saw 20 years as the family sofa before needing to be recovered. It's as solid and heavy as any sofa you've ever carried and the cushions are down-filled. We could not have bought a new sofa for the cost of recovering. And such is also the case for the two arm chairs, which my mom got at an auction for $.25 each. I will say that for years I was very sure it was clear why no one else bid on them. They are covered in gold brocade and one of them has needed its springs retied since my mom bought them. But ugly or not they have good bones and mahogany arms and legs. I recently went looking on the web and found something similar for over $1000 for one chair. We definitely couldn't get a set for the price it will cost to buy fabric and recover them. Part of me wishes I could learn to do real upholstery. I can recover a dining room chair, but doing a sofa or an arm chair with any level of competance would require more time and practice than I wish to expend upon it. But some time soon, I may have what feels like a brand new living room. Well, my goodness...your PhotoShopped version was doggone good. I put them side by side. You just couldn't tweak the puffiness of new cushion stuffing, could you!??! Love the new look of it. Very stylish and snazzy! I love the woodwork on the sofa. And pish-posh to those who think it's extravagant not to ditch a fine piece of furniture! Our living room sofa was bought down the street at a consignment store, having been reupholstered previously. Unfortunately, my wild cat took it upon herself to destroy the upholstery at the front corners. Welcome to the Carnival. As I read through the recipes this week, it seemed like they all fit into several broad categories of meal plans. Naturally one could mix and match, some things could be in more than one place and one probably wouldn't make everything for any one meal, but here are the suggested meal ideas as I saw them. Although it is September, down here in the South, it doesn't feel like Summer is leaving any time soon and the tomatoes and okra keep right on growing, which means we have plenty of time for more picnics and time to try recipes like the Coleslaw Kevin at technogypsy makes. This isn't your every day 'slaw, and with lime, ginger and cilantro among the ingredients, it's bound to be super tasty. I have learned to embrace many Southern foods in the 10+ years that I've lived down here. Grits and sweet tea were never an issue, but I didn't think I would like okra as much as I do. I never thought I'd like it enough to cook it and grow it, but I do both. There are many wonderful ways to prepare okra that don't bring out it's snot-like qualities. The quintessential Southern way, is, of course, to fry it. David from third world county offers a simple and tasty recipe, which happens to be almost exactly like mine -- except I use self-rising flour and corn meal instead of adding baking powder separately. Either way, it is really, really good. Try it. You'll like it! OzarkLad's Roasted Tomatoes and Corn Casserole seems a perfect summertime recipe and is going on the list of things I will be making soon. It's a good thing I'm pretty sure I'll love it though, because if they see the tomatoes my children won't touch it and one of them feels the same way about corn. Which means more for me. With a name like Jim's Heretic Fusion BBQ Sauce, you know Frazzled Dad is giving us a recipe that is going to be interesting. Use up all the fresh vegetables from the garden and farmer's market in Allan's Improvised Vegetable Curry. Mmmmm...curry...photos available here. The Glittering Eye has a recipe for Black-eyed Pea Salad, which sounds delicious, although I think that many would drool even more over the smoked baby-back ribs served with the salad. From Trub, comes another great looking salad -- Toasted bulgur salad with corn and tomatoes. And then the pineapples all jump out and yell, "Surprise!" Oh, maybe not. But KeeWee's Corner does have a lovely sounding dish called Pineapple Surprise. Not necessarily a summer food, but since for some of us chocolate is just a year-round food, I'll put Tammi's Easy Fudge in here since it's nice to make something chocolatey that doesn't heat up the kitchen much. Okay, I admit that putting this in Tex-Mex is probably a big stretch, but deal with it. Everything and Nothing shares a great sounding recipe for Hot Jalapeno Crab Dip, but I can't help thinking that it should be an exclamation of surprise and shock. "Hot Jalapeno Crab Dip, Batman!" One For the Road recreated a delicious and easy Chicken Tortilla Soup that she remembers from time spent in Montana. Although I'm all for scratch cooking in its time, a soup that can be made quickly and easily all from canned goods sounds great for those hectic evenings. I'm going to be trying this soon. From A Weight Lifted come Quick and Easy Tacos. For the extreme Atkins diet, we turn to George from In the Interest of Me who gives us ChupaQuesos. Although I will probably never possess a non-stick skillet that is non-sticky enough for this recipe, it does look interesting and I learned a bit of French in the process of reading it. For a whole Tex-Mex sort of meal at once, JamiLeigh presents Colorful Black Bean Salad to go along with her ealier recipes for Fiesta Spanish Rice and Cilantro Sour Cream. And for dessert -- I've never run across a sweet tamale before, but Brian B. from Memento Moron has a really interesting recipe for Sweet Blue Corn and Hazelnut Tamales. What a fascinating idea! In some parts of the country nights are coming early and the air is getting crisp. Not here in Tennessee, unfortunately, but I can imagine that fall might come soon and I can dream about cold weather foods. Booklore has a recipe for Hummus to start a meal off right or just to snack on. Chowder has always been a favorite soup of mine. One I love to cook and loved to go out for when we lived down the street from a little restaurant called The Chowder House. There's not much like that around here that I've found, so I generally stick to cooking my own now. The Corn (or clam or fish or seafood) Chowder from Punctilious at Like News But Tasty looks delicious. Just in time to test the recipe before Canadian Thanksgiving and then try it again for the American version, Daily Pundit presents Sausagemeat Stuffing. Kevin Weeks of Seriously Good, whom I met and chatted with at the BlogNashville, shares a recipe for beer bread and includes a photo that had me wanting to lick the computer screen. Taleena at Sun Comprehending Glass is working on the creation of a Braided Raisin Loaf recipe. She's combining two recipes and would love feedback about what she's put together. Beth, the lovely and gracious patroness and founder of the Carnival of Recipes, has a recipe this week that is not her own, but rather a recipe for Brown Sugar Meatloaf that can unite liberals and conservatives at the dinner table (as long as no one is a vegetarian). It comes from Amber, also known as Disillusioned, a poster at Daily Kos and MoveOn.org. You want easy? CaltechGirl of Not Exactly Rocket Science claims to have the recipe for the Easiest Stuffed Peppers Ever. Warm up on a cool night with Cajun Chicken from my fellow Munuvian at Owlish Mutterings. Muse at me-ander presents Surprisingly Simple Banana Cake, which uses her Easiest Cake Recipe as its base. For some only the finest things will do. For those with a refined palate and/or delusions of granduer, here are some recipe suggestions. Looking for the perfect sandwiches for an tea party? Christine at Morning Coffee, Afternoon Tea presents Afternoon Tea Party Sandwiches She has recipes for Almond Mushroom Chicken & Cream Cheese, Egg Salad, and Havarti Garlic. The last one sounds like a must-try to me. I wonder if my children would eat it if I left off the tomato? Making gourmet cooking easy for the rest of us, Tinker at The Secret Life of Shoes gives tips and how-tos for Baked Brie Extraordinaire . For those wanting a fine and tasty fowl. Elisson of Blog d'Elisson says Duck You! and gives us Duck with Parsnips and Shallots. Not only does the recipe sound delicious, but you get all that tasty duck fat to save for later cooking. I really like it for lightly sauteeing vegetables in. Need a little chocolate in your life? Look no further than ArmyWifeToddlerMom's Chocolate Chambord Cake. I've made a flourless chocolate cake before. It takes a bit of effort, but is worth the work. This one, with the addition of the raspberry liqueur, sounds even better than my old recipe. « Hide "The 56th Carnival of the Recipes"
You have set a very lovely table, Jordana. If you like using reserved duck fat, sometime you really should prepare a goose for a family gathering. The goose itself is good and there's an enormous amount of incredibly delicious fat for future use. Great looking layout. I love the graphics! Thanks for your hard work putting this together. The other day I let The Baby Girl eat black beans. They were well received, and enthusiastically consumed. She really got into her food and her food got all over her. So I took pictures. Seeing as how we are in the digital camera age and even the smallest of children know that you can see photographs right on the back of the camera, The Middle Girl immediately demanded to review the shots I'd taken saying, "I want to see the dirty pictures!" 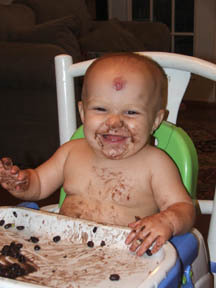 Warning: Black beans take a lot of scrubbing to remove from small children and tend to leave ring around the tub. What a darling little fattikins. She's adorable. 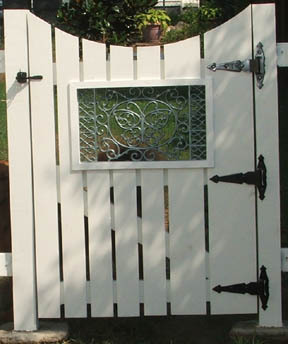 Oh, and love the gate too. Very artistic, which I expected. That reminds me of a logo from long ago when I was just a tiny kid--probably around 1965 or '66. The Birmingham Yellow Pages used to have an ad of some sort, and the clip art the company used was a baby playing in dirt. Every year I begged my mother to find the dirty baby in the phone book. You sure have a cutiepie there. What a cutie! I have a very simular picture of Rebecca coated in black berries. good for you and good for Bea! That picture just squeezed my heart - she's so precious. Serve her some rice (complementary protein source) and you'd have a budding vegetarian. Oh, she is so sweet! Love the dirty bean action! I guess we're just uptight. When Jay starts spitting out his food, we wipe him up asap. Might just be laziness, though- the messier he gets, the more gets smeared around the chair, the carpet, his clothes, etc. If we contain it at the source, our slovenly housekeeping isn't as obvious or as serious a fault! Anyway, you're brave. I'm sure Bea LOVES it. You can tell from the photo! So cute! She looks like she's having a wonderful time. :) I know what you mean about the digital camera, too ... my nieces and nephews all demand to look at the picture on the back. They also keep dogs where they belong, which is really more to the point this time, since this stretch of fence doesn't run along the property line, but between the front and back yards. Long, long ago, in the distant past -- in May, I think, we started building a short nine foot piece of fence along the side of the house. We already have a piece of chainlink fence and a gate at the front of the side yard, but we'd like to get rid of the chainlink and push the dog back to the back of the yard. The fencing project began. After preliminary planning, post holes were dug. Posts were set in gravel and concrete and all was well. Then the posts sat there until the end of June when the two short stretches of fence were built and the frame for the gate was cut. Work proceeded on and off, but with life and three children getting in the way, the fence mostly sat unpainted and the gate sat unfinished in our bedroom. But all such things must finally be pulled out and worked on again. So the weekend before last, we took the pickets that had been roughly placed off the gate, Justin sanded everything and I painted. We also decided to cut a few of the thin trim pieces out of PVC board, so as to ensure their rot-resistance. Then the gate was totally assembled, and all the holes, cracks seams and what-nots were caulked and/or filled with exterior wood putty. And then came more sanding. And more painting. This Saturday I spent a large portion of the morning painting the pickets and posts for the fence. 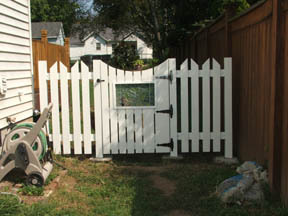 Monday I put a second coat of paint (actually, solid stain) on both the gate and the fence. It was a race against the sun in the end, and Justin had pull out his spotlight to finish, but with lots of props, shims and his wife holding the thing in place, the gate finally got hung up. We still have to put caps on the posts and do a little touch-up painting, but I think it's turned out gorgeous. Justin says he'll build one for anyone who can pay his asking price of just a measly $10,000. Looks like something in a magazine photo--bravo! Wow! Our fence in that we built wasn't nearly as fancy as yours. We just made a plain picket fence with the bottom stringer a 12 inch board of cedar half buried to prevent doggies from digging their way out. Our dog isn't much of a digger and he's pretty large to squeeze under anything, but we are going to put brick under this fence eventually. Beautiful, can't afford your prices though. I suspect he would add travel costs also. Thanks everyone! Earth Girl, I think we could roll in the travel expenses. ;) But isn't your husband a master carpenter or furniture maker or something? I am coveting your gate. That is so gorgeous! Makes my chain link gate look awfully sad. I'm still kind of worn out, but am feeling a whole lot better today. And on the subject of much better -- on Saturday, The Boy said, "I wish I had school today. I like it now." Hooray! That was certainly an answer to a prayer. So school is going well. Thank you. I'm glad a longer bit of sick leave wasn't required. No, I haven't fallen off the planet. This past weekend was a very busy and productive one, but one in which I finally succumbed to a cold. A cold isn't so bad, but on top of it, I also seem to have caught the worst intestinal virus ever. So think of me eating a lot of bananas, rice, applesauce and toast and drinking a lot of fluids. I'll return when I feel better. Well bless your heart, Jordana--seems like you move from one to another. Hope you are back up and going soon. What, no finger-pointing at the most likely source of cold germs: kidlets? Now that oldest is back at school, he'll have a rich "pool" to share from. Oh yeah ... get well soon! It's no fun being a BRAT. I assume it's your infirmity which caused you to forget your participles. Don't you mean "haven't fell"? I meant to type "fallen". Blaming illness is as good an excuse as any I suppose for the typo. It is pretty scary how things spread all over the country. Reading various blogs gives you a unique perspective as far as how things spread. My husband is the last to get the cold and of course he thinks HE has it worse or has some different malady.